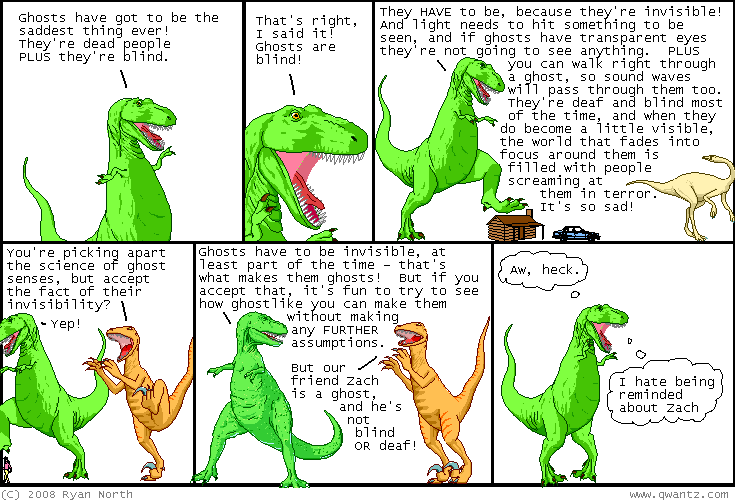 Dinosaur Comics - January 22nd, 2008 - awesome fun times! January 22nd, 2008: My street-artist friend Posterchild has done an interesting project in which he made up his own TTC (Toronto transit) fliers and put them on the subways and streetcars. They ranged from self-guided tours of the graffiti along the transit line to colouring and activity books, but I think the strongest piece was the one on Friday that claimed that starting in the new year, transit in Toronto is going to be free. The pamphlets were covered on Torontoist and in the Toronto Sun (page three! ), which went so far as to contact the head of the TTC, who said he thought the pamphlets were funny and drew attention to an important matter. So yay Posterchild! One year ago today: the second panel i took from a spam message i received, which promised me erections so powerful i could both flip cars AND poke holes in walls. that's pretty rad. the spammer community apparently believes the ultimate male fantasy is property-damaging erections?